Review written by and copyright: Paul Lewis (15th February 2010). In the 1970s, the broadcaster Hugh Greene (brother of author Graham Greene) edited a series of anthology collections of Victorian-era short stories by authors who attempted to emulate the success of Sir Arthur Conan Doyle’s fictional creation Sherlock Holmes. The first of these volumes was titled The Rivals of Sherlock Holmes (More Rivals of Sherlock Holmes: Cosmopolitan Crimes was published in 1971, The Further Rivals of Sherlock Holmes appeared in 1973 and in 1976 Greene edited the final entry into this series, The American Rivals of Sherlock Holmes); and under the same title, in 1971 Thames Television delivered a series of thirteen adaptations of the stories contained in the Greene-edited anthologies, including dramatisations of works by such authors as R. Austin Freeman (the creator of the first forensic detective, Dr John Thorndyke), Ernest Bramah (the creator of the blind amateur detective Max Carrados) and William Hope Hodgson (the creator of the ‘ghost detective’ Carnacki). (Hugh Greene served as creative consultant on the series.) These episodes featured some strong central performances from a number of well-known actors (including Donald Pleasance and Peter Vaughan). Although studio-bound, many of these stories created a strong atmosphere, depicting Victorian England as a place of Gothic terror, creeping dread and brutal outbursts of violence. In their depiction of Victorian England as a place of Gothic nightmares, the series tapped into the popularity of Hammer horror pictures such as Frankenstein Must Be Destroyed (Terrence Fisher, 1969) and Hands of the Ripper (Peter Sasdy, 1971). 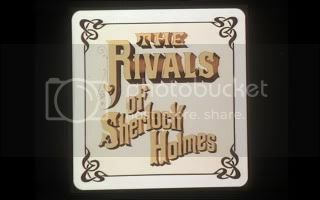 In 1973, Thames Television produced a second series of The Rivals of Sherlock Holmes. These episodes feature a widening of scope and a movement away from the first series’ focus on Victorian England. 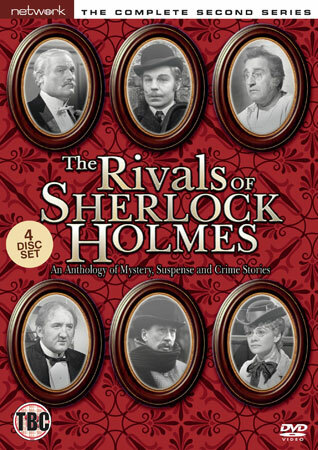 Many of the episodes in this second series are taken from the second volume of stories edited by Greene, More Rivals of Sherlock Holmes: Cosmopolitan Crimes. (In America, this volume was retitled The Foreign Rivals of Sherlock Holmes.) Many of the stories in this volume were by European authors, and the narratives took place across the world, from Cape Town to Vienna. Accordingly, this second series eschews the Gothic depiction of Victorian England that characterised the first series of The Rivals of Sherlock Holmes; the result is a series that is still hugely enjoyable but loses some of its sense of focus. Where the titles sequence of the first series of The Rivals of Sherlock Holmes had begun with a narration which declared that ‘In late Victorian London lived many detectives who were The Rivals of Sherlock Holmes’, due to its focus on ‘the foreign rivals of Sherlock Holmes’ this second series contains a slightly different voice-over: 'In late Victorian times there were many detectives: the rivals of Sherlock Holmes'. Adapted from Baroness Emmuska Orczy’s story, first published in The Royal Magazine in 1901 (and rewritten for inclusion in Orczy’s 1908 collection The Old Man in the Corner), ‘The Mysterious Death on the Underground Railway’ opens with a fog-wrapped railway station. A young woman, Beatrice Hazeldene (Lois Baxter) is murdered whilst travelling on a train to Aldersgate. Polly Burton (Judy Geeson), a journalist for The Echo, and her policeman friend Sergeant Frobisher (Richard Beckinsale) become interested in the murder of Beatrice, who as yet has not been identified by the police. Polly elects to take a look at Beatrice’s body. Visiting the morgue and looking through Beatrice’s belongings, Polly observes that the young woman had ‘a taste for the expensive’ and discovers a man’s handkerchief, with the initials ‘F.E.’ embroidered on it. Whilst Polly is at the morgue, Laura Stanley (Cyd Harman) identifies it as that of her sister Beatrice. Beatrice was married to a man named William Hazeldene (Anthony Corlan), who has accompanied Miss Stanley to the morgue. At the inquest into Beatrice’s death, Hazeldene suggests that his wife had in recent months become increasingly morose due to her husband’s new employment, which took him ‘away from home for several days’ at a time. During this time, it seems that Beatrice only had her sister Laura as a confidant. However, Polly suspects that Hazeldene is lying; she believes that Beatrice had been conducting an affair with the man whose handkerchief was amongst her belongings when she boarded the train. The handkerchief, it is revealed, belongs to a man named Frank Errington. Errington is soon suspected of murdering Beatrice, and Polly’s uncle, Sir Arthur Inglewood, is asked to represent Errington in court. Sir Arthur is confident that Errington is innocent of Beatrice’s murder, but Polly is not so certain. ‘The Mysterious Death on the Underground Railway’ could be described as proto-feminist in its use of a female investigative lead and its underscoring of the chauvinism associated with Victorian England: when Polly expresses interest in the case of Beatrice’s murder, Frobisher patronizingly tells her to ‘stick to the fashion columns’; later, Sir Arthur ushers Polly out of the room during a key meeting with Errington, asking her, ‘Would you, like the nice girl you are, kindly make us a cup of tea?’ However, a closer examination of the narrative reveals that Sir Arthur solves the case and Polly is used as little more than a patsy in Sir Arthur’s attempt to capture Beatrice’s killer. Polly has illusions of autonomy and independence but is ultimately reliant on the men around her: this is reinforced in the closing shot, in which she walks away from the camera, arm in arm with Frobisher. Most of Sir Arthur’s deductive reasoning and evidence-gathering takes place behind the scenes, and is only communicated to the audience via the scenes in which Sir Arthur explains his methods to Polly. In fact, Polly is arguably peripheral to the case as a whole, and as the episode is focalised through Polly’s perspective the audience is given an indirect view of the case. 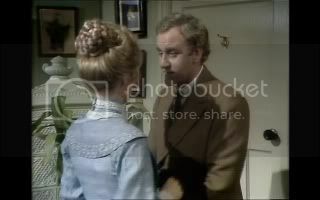 An early comment by Sir Arthur resonates throughout the episode: during his first onscreen meeting with Polly, Sir Arthur tells his niece that all crimes are essentially motivated by greed. Polly expresses disbelief at this bold assertion, but the resolution of the narrative proves Sir Arthur’s declaration to be true. (Sir Arthur also reinforces the importance of an understanding of human psychology, telling Polly that ‘As I’ve always said […] a knowledge of basic human behaviour is essential, even indispensable, to the legal mind’.) In effect, Sir Arthur’s use of Polly as bait for the killer, during a late sequence in the episode, reinforces Polly’s similarity with quasi-autonomous, strong-willed but ultimately helpless, Gothic heroines such as Maud Ruthyn in Sheridan Le Fanu’s Uncle Silas (1865) or Catherine in Emily Bronte’s Wuthering Heights (1847). 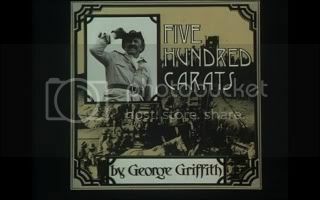 Focusing on the character of Inspector Lipinzki (played in the episode by Barry Keegan), the creation of George Griffith, ‘Five Hundred Carats’ takes place in Cape Town. The episode opens with a man, later revealed to be Lomas (Richard Morant), pounding on the door of the police headquarters before being murdered by an unknown assailant. This pre-credits sequence is revealed to be a prolepsis of events that take place later in the narrative, instigated by the discovery of a large diamond. The diamond weights over five hundred carats and is worth over a million pounds. 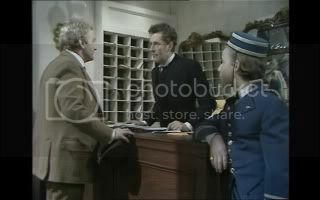 Lomas and another man, Philip Marsden (Martin Jarvis), are commanded to take care of the diamond, which is placed in a new, seemingly uncrackable safe. Also in Cape Town is an American representative of the New York-based Van Buren firm, Cornelius (Alan Tilvern), and the employer of Marsden and Jarvis, Arundel (Patrick Barr). One night, Marsden discovers Lomas in a drinking establishment owned by Mrs Sullivan (Aideen O’Kelly), a widow. Lomas has abandoned his post guarding the diamond. Marsden censures the younger man. When they return to the safe, they find the diamond has been stolen. The theft of the diamond causes panic. Arundel orders Lipinzki to recover the diamond and capture the thieves. The prime suspects in the theft of the diamond are Cornelius, Lomas and Marsden; Marsden and Lomas also appear to be vying for the attentions of Mrs Sullivan, who is interested in neither. This causes confrontation between Lomas and Marsden. Lipinzki must deal with the class and ethnic prejudice that is directed towards him by the Lomas and Marsden, whilst attempting to retrieve the diamond and unmask the men responsible for its disappearance. What is interesting about this episode is Lipinzki’s status as an outsider likens him to the protagonist of town-taming Western such as The Man With the Gun (Richard Wilson, 1955) or Warlock (Edward Dmytryk, 1959). Like Robert Mitchum’s Clint Tollinger in The Man With the Gun and Henry Fonda’s Clay Blaisedell in Warlock, Lipinzki is seen as a necessary evil by the middle-class Englishmen who represent the diamond company, which is effectively in control of the region. They dislike Lipinzki because of his association with the area’s uncouth past but respect him for his involvement in the process of ‘civilising’ the region; like Mitchum and Fonda in the Westerns cited above, Lipinzki is seen as tainted for his skill as a ‘lawbringer’, the very reason why he is useful to the populace. 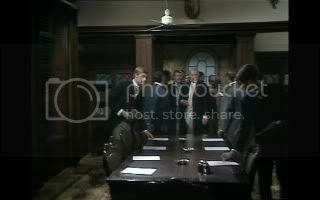 In an early scene, Marsden and Cornelius are drinking in the local gentleman’s club, and Arundel tells Marsden and Cornelius that the club secretary objects to Lipinzki’s attendance at the club. However, as Arundel notes, 'This town was a battlefield before he [Lipinzki] was appointed'. When Marsden snobbishly asserts that he 'see[s] the club secretary's point', Cornelius asks him, 'Do you mean that he [Lipinzki] spits on the carpet, or is it that his name ends in “-zki”?' 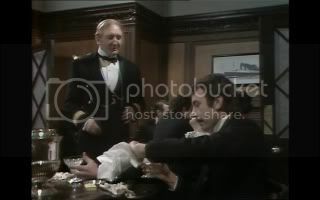 'It's just that this club is for, well, gentlemen', Marsden asserts. The prejudice against Lipinzki recurs throughout the episode. Marsden objects strongly to Lipinzki’s suggestion that he is a suspect in the theft of the diamond. When Lipinzki searches Marsden, Marsden arrogantly tells Lipinzki, 'You've forgotten your place […] It's not so many years since you were a common labourer'. 'I'm a policeman now', Lipinzki asserts. However, Marsden humiliates Lipinzki by forcing the policeman to issue a public apology and a pledge not to harass Marsden again. Later, after Lomas’ death, Marsden suggests to Lipinzki that Lomas may have been killed by a local and brutally refers to Lipinzki as ‘you ape’. The episode is also subtly critical of the colonisers’ relationship with the region: the theft of the diamond from the safe is subtly equated to the colonisers’ theft of the diamond from the land. It isn’t revealing too much about the plot to declare that at the end of the narrative, the diamond has still not been recovered. Some time after the central plot takes place, Lipinzki relates the events to Cornelius. ‘And you still don’t know where the diamond is?’, Cornelius asks. ‘Yes, I do. Where it belongs: Africa’, Lipinzki asserts. Eagle-eared viewers will notice the use throughout the episode of some of the striking and distinctive library music that was deployed in Michael Reeves’ Matthew Hopkins: Witchfinder General (1968). ‘Cell 13’ features the character of Augustus S. F. X. 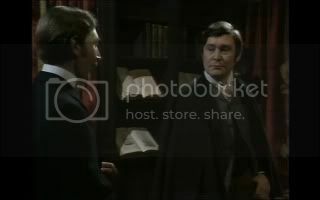 Van Dusen (Douglas Wilmer), who appears in two of the stories in this second series of The Rivals of Sherlock Holmes. 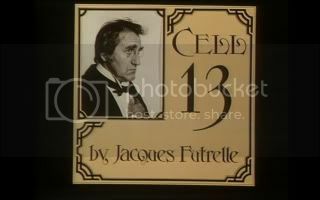 The episode is adapted from a 1905 short story (‘The Problem of Cell 13’) by the American journalist and author Jacques Futrell, whose career was cut short by his tragic death aboard the Titanic. ‘The Problem of Cell 13’ was the first story to introduce the character of Van Dusen. Futrell’s Van Dusen stories were closely modeled on the archetypes established by Conan Doyle’s Sherlock Holmes narratives and Edgar Allan Poe’s stories about the detective C. Auguste Dupin (‘Murders in the Rue Morgue’, 1841), with Van Dusen as an expert ratiocinator, a man often referred to as ‘the Thinking Machine’. Interestingly, the actor who plays Van Dusen in this adaptation, Douglas Wilmer, had already played Sherlock Holmes in a 1964 adaptation of ‘The Speckled Band’, produced for the BBC’s anthology series The Detectives, and in twelve episodes of Sherlock Holmes (BBC, 1965). ‘Cell 13’ opens with an attempted escape from Grangemoor Prison. 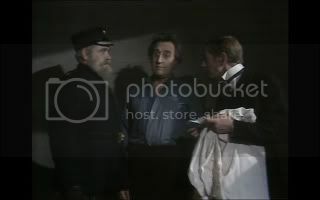 The escapee, number 9437, is caught and brought before the prison governor (Michael Gough), who asserts that ‘No-one has succeeded in escaping from Grangemoor yet; and the fact is, no-one can’. Hearing of the attempted escape, Professor Van Dusen claims that ‘Nothing is impossible’. He is told by the architect responsible for the building of Grangemoor prison, a man named Fielding (Donald Pickering), that Grangemoor has been fitted with a number of modern devices, such as ‘electricity and arc lamps, an idea that I culled from our American cousins’. However, Van Dusen is confident that it is possible to escape from any prison. ‘Lock me in cell thirteen, or any other cell, in Grangemoor Prison, or any other prison, with nothing but the clothes I’m wearing; I’ll escape in a week’, Van Dusen boasts to the clearly offended Fielding. Wilmer’s depiction of Van Dusen is perfect, drawing on Wilmer’s characterisation of Holmes: Van Dusen shares Holmes’ arrogance and aloof nature, not to mention his absolute dedication to logic. J. Kenneth Van Dover (1994) claims that Futrell attempted to distinguish his Van Dusen stories from Conan Doyle’s series of narratives about Sherlock Holmes by ‘retaining some eccentricity [of the Holmes character] and pressing the methodological emphasis to an extreme degree’, resulting in a character defined by his ‘genuinely mechanical intelligence’ (115, 120). (Hence Van Dusen’s acquisition of the nickname ‘the Thinking Machine’.) Van Dusen’s method of escaping the prison cell grows out of his close observation of the prison and its guards, and Van Dusen’s methods of deduction. 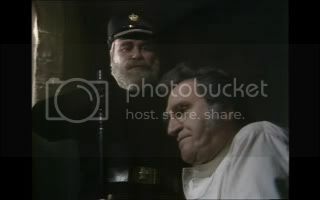 Van Dusen’s revenge on the bullying chief prison officer (Ray Smith) is a delight too, and the episode makes effective, claustrophobic use of its prison setting. 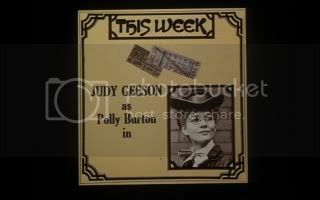 Featuring the character of John T. Laxworthy (played in this adaptation by Bernard Hepton), the creation of E. Phillips Oppenheim, ‘The Secret of the Magnifique’ opens outside Parkworth prison where a man in a Hansom cab collects a released prisoner, Sidney Wing (Christopher Neame). The driver of the cab earns Wing’s trust by telling him that he ‘ain’t the rozzers’. 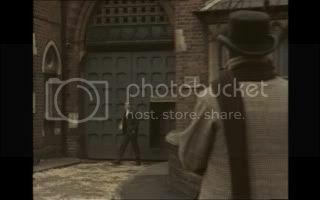 Dropping Wing off at an address in London, the driver of the cab then picks up another released convict, Anderson (Neil McCarthy), from a train station. At the house in London, Wing is given a letter from a man named Laxworthy. When Anderson arrives at the same address, the driver of the cab reveals himself to be Laxworthy. Laxworthy demonstrates his awareness of Wing and Anderson’s pasts: Wing is a middle-class man who, in Laxworthy’s words, ‘made foolish mistakes’; and Anderson is a former footman who, through desperation and poor guidance, became a safecracker. Laxworthy offers to sponsor both Wing and Anderson. He tells Wing that he simply wants him ‘to be the young gentleman you were educated to be’, and Laxworthy also asks Wing to ensure that Anderson ‘cultivates the style of a gentleman’s gentleman’ that was Anderson’s role prior to his attraction to the career of safecracking. Weeks later, Laxworthy transports Anderson and Wing to Paris. Laxworthy suggests that Wing and Anderson’s new personae are to be deployed to ensure the success of his enterprise, which he suggests is simply taking money off those who ‘do not acquire their wealth by noble means’. However, it seems that Laxworthy’s real interest lies in the cargo of the French warship the Magnifique. According to Laxworthy, the Magnifique is carrying a new ‘guided torpedo that can hit a target without fail at up to five miles’. Laxworthy’s intent is to stop the Marquis Lefant (Gary Watson), who believes that to stop war, every country must have access to the new guided torpedo carried by the Magnifique. Oppenheim was a contemporary of William Le Queux and John Buchan; and along with Le Queux and Buchan, Oppenheim is often credited as creating the conventions of the modern espionage genre of literature, paving the way for authors such as Eric Ambler and Ian Fleming. ‘The Secret of the Magnifique’ is an effective spy story with an interesting twist: Laxworthy is clearly a humanist rather than the bitter and world-weary espionage agent to be found in many later novels from this genre. Laxworthy ‘rescues’ Wing and Anderson from their lives in prison, reasoning that because neither man has any money their ‘position is preordained: you must take your place among the aggressors’. Wing observes that Laxworthy’s comments show ‘little faith in the collective role of our penal institutions’. Laxworthy dryly notes that, ‘I have none at all. The very impecuniosity that leads men to crime is inevitably more desperate when they are returned to the world than when they first transgressed’. 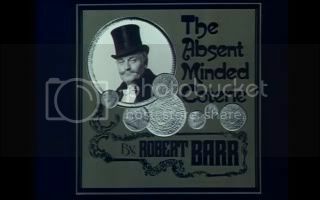 In this episode, Charles Gray plays Eugene Valmont, a character created by Robert Barr. Written in 1906 and set in 1896, the story features Valmont approached by Inspector Hale (Barry Linehan) of Scotland Yard. Hale asks Valmont to help in the investigation of a counterfeiting ring. Valmont is pointed in the direction of Ralph Summertrees (Dennis Clinton), who lives on Park Lane. Hale suspects Summertrees because of his ‘luxurious mode of living’ and apparent lack of a source of income. Summertrees masquerades as a writer, apparently; every day, as Hale tells Valmont, Summertrees deposits ‘a great deal of money’ in the bank, ‘all in coin’. After investigating Summertrees, Valmont discovers that by day, the man assumes the identity of Simpson, the owner of a curiosity shop. Valmont also interviews Summertrees’ butler, Podgers (David Battley), who reveals that Summertrees takes a number of newspapers and ‘sticks to his writing’. Upon close investigation, Valmont discovers that all of the newspapers Summertrees takes contain ‘advertisements signed by the same name’: these advertisements, which tie back to Simpson’s curiosity shop, promote ‘a cure for absent-mindedness’. Valmont deduces that Summertrees is not the counterfeiter that Hale seeks but is instead ‘a criminal more subtle, more audacious, more devilishly ingenious than any I have ever known’. Valmont sets a trap in his attempt to snare Summertrees and reveal the extent of Summertrees’ criminal activity to Hale. 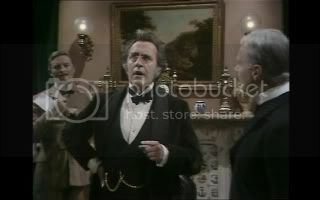 The eccentric Frenchman Valmont displays a love of exotic food (at one point, he cooks frogs’ legs and attempts to persuade Hale to try them) who is very precise about his role. When he is described by one character as ‘France’s greatest detective’, Valmont corrects: ‘No, not detective. Shall we say her [France’s] greatest amateur detective, no?’ In his precise nature and his culinary interests, Valmont is sometimes cited as an influence on Agatha Christie’s Poirot (see Queen, 1969: 51; Maida & Spornick, 1982: 87). 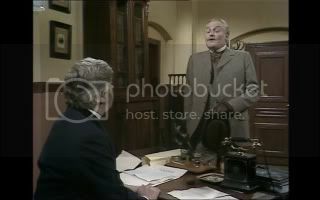 In fact, Charles Gray’s performance as Valmont, which downplays the humour of Barr’s stories (which were designed as parodies of Sherlock Holmes-style narratives), has strong pre-echoes of David Suchet’s depiction of Poirot in Poirot (LWT, 1989- ). 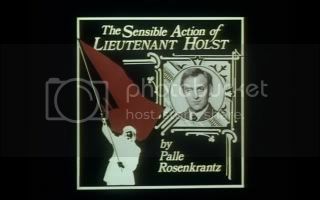 Adapted from Palle Rosenkrantz’s 1909 story ‘A Sensible Course of Action’, ‘The Sensible Action of Lieutenant Holst’ focuses on Lieutenant Holst (John Thaw), a mid-ranking police official in Copenhagen, Denmark. 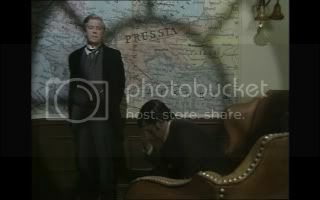 The episode is set against the backdrop of the Russian revolution, and the pre-titles sequence depicts Russian Count Nicolai Wolkonski (Julian Fox) being arrested for treason and beaten. Later, in Copenhagen, a mysterious man arrives at a luxurious hotel and books a private suite. 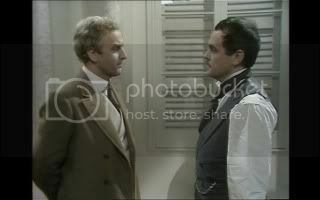 His appearance seems to disarm the desk clerk; the man is later revealed to be Dmitri Wolkonski (Philip Madoc), Nicolai’s brother. Meanwhile, over breakfast Lieutenant Holst’s wife Ulla (Virginia Stride) comments on the massacre of civilians at Odessa (in 1905) by the czarist military. Ulla tells Holst that, ‘I’m glad you don’t work in a country like that; I wouldn’t want you mixed up in any revolutions’. Holst replies simply that, ‘No, no. I just get drugs, prostitutes and burglaries’. At work, Holst is distracted from his investigation into the disappearance of a man’s wife by Inspector Anderson (Michael Turner). Anderson commands Holst to deal with the case of Maria Wolkonski (Catherine Schell), who declares that her brother-in-law Dmitri wishes to murder her because he believes that she betrayed her husband, Nicolai. Maria Wolkonski claims that Nicolai was ‘infected’ with ‘those damnable [anti-czarist] politics’. According to Maria, Nicolai was arrested and died in prison after catching pneumonia. Following Nicolai’s death, Maria asserts that Dmitri, who was also imprisoned for anti-czarist activities, escaped from prison and kidnapped Maria and Nicolai’s son Ivan, taking him to Vienna. However, in Vienna Ivan also died, apparently of pneumonia. Claiming to fear for her life, Maria sold her estates and fled through Europe, followed at every turn by Dmitri. After listening to Maria’s story, Anderson tells Holst that ‘It clearly isn’t a police matter, is it?’ before asking Holst to tell his wife Ulla to take care of the Countess. Holst visits Dmitri at the hotel. Dmitri offers a different story, suggesting that Maria reported Nicolai to the authorities, and that before he died Nicolai asked Dmitri to take care of Ivan. Because Dmitri shared Nicolai’s political beliefs, he fled Russia with Ivan and relocated in Vienna. However, Ivan died of pneumonia. Dmitri claims that the woman who claims to be Maria is in fact a czarist agent sent to assassinate him, and that he is the one who is in danger. Holst must try to reconcile these two very different stories, but at the same time he struggles with the bureaucratic regime that exists within the police force. Anderson tells Holst that he ‘would rather we got them both out of the country’. The authorities seem disinterested in Holst’s case, and Holst begins to suspect a conspiracy. Holst finds his hands tied by the bureaucratic context in which he is forced to work, which railroads him away from taking the most ethical form of action: initially, Anderson diverts Holst away from the case of a man whose wife has disappeared (and who reappears throughout the episode, causing Holst – who is unable to help the man due to his preoccupation with the case of the Countess – to question his conscience), and ultimately Holst is led to a series of actions that result in the death of a man fleeing czarist Russian agents. Despite Holst’s desire to stick to protocol and do things ‘by the book’, he is forced to circumvent certain protocols and, when he refuses, his decisions are voided by his superiors. Although Holst tries to act in good conscience, his hands are tied, and during one conversation Anderson reminds Holst that ‘in this job one has to be a diplomat, not a saint’. Finally, the episode suggests that Holst will be censured for his desire to ‘do the right thing’ and follow established protocol. The action takes place against the stirrings (in the 1900s) of what would become the Russian revolution, and in an almost Kafkaesque manner the episode draws subtle parallels between the anti-democratic rule of Russia’s czars and the bureaucratic regime within Copenhagen’s police force, suggesting that both forms of government are essentially totalitarian. 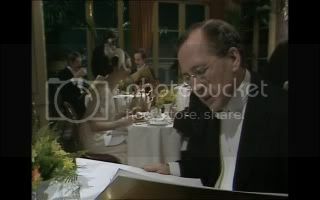 At the start of the episode, Holst’s wife Ulla (Virginia Stride) tells Holst that she is ‘glad you don’t work in a country like that; I wouldn’t want you mixed up in any revolutions’. Holst simply replies that he ‘just get[s] drugs, prostitutes and burglaries’. However, the episode suggests that Holst is in fact working in a democratic state which shares some subtle similarities with the anti-democratic regime in Russia, and the implication is that the methods by which bureaucracy manipulates individuals to achieve its aims are more insidious than those found in a totalitarian state. In a later conversation with the Countess, Holst muses, ‘I can’t help wondering […] which side I’d be on if I lived there’. 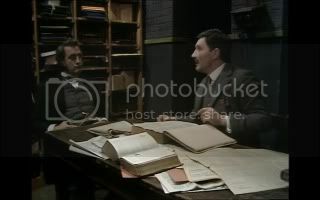 Towards the end of the episode, the Russian refugee Dmitri directly illustrates the parallels between bureaucracy and totalitarianism when he tells Holst that ‘You have a democracy here in Denmark. I mean, no man lives in fear of a midnight knock on the door. All I and my comrades want to do is establish a similar kind of democracy in Russia. And for that, we are called “anarchists”. And you, a sensible and liberal man, assists the kind of tyrants your country got rid of centuries ago. I do not blame you: you are doing your “duty”’. 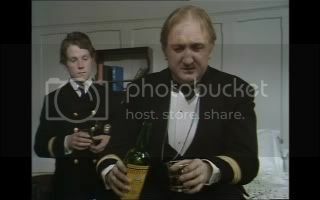 John Thaw’s portrayal of Holst, a man whose hands are tied by bureaucracy, has echoes of Thaw’s later role as Jack Regan in The Sweeney (Thames, 1974-8); this is far and away one of the strongest episodes in this set. 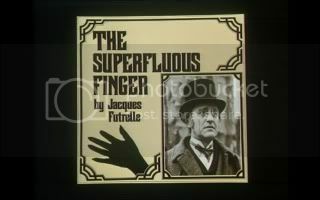 ‘The Superfluous Finger’ sees the return of Jacques Futrelle’s creation Professor Van Dusen (aka The Thinking Machine), once again played by Douglas Wilmer. 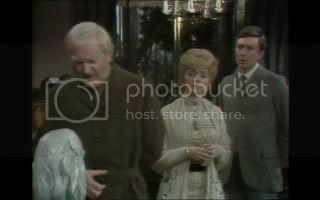 The episode opens with an eccentric elderly aristocrat, Sir Hector Drummond (William Mervyn), being visited by his niece, Miss Rossmore (Veronica Strong). Drummond reminds his niece that their ancestors were a ‘bloodthirsty lot of ruffians. Mad as march hares, most of them. Some say I am’. Relating stories from the family history (‘We seem to have a habit of backing the wrong side’, Drummond asserts), Drummond proceeds to show Miss Rossmore some of the family’s weapons. Whilst showing her a flintlock dueling pistol, Drummond accidentally fires the gun and shoots his niece. (‘Must have been loaded’, he tells his manservant Sterling (Wallas Eaton); ‘Still, that’ll teach her to come sniffing round before I’m under the ground’. 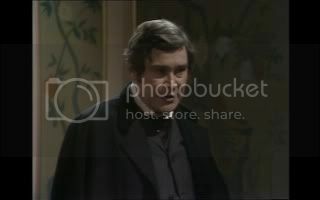 After the credits, we are introduced to a surgeon, Sir Tobias Prescott (Laurence Payne). Prescott is approached by a mysterious young woman, who refuses to give her name (‘I could give you a name, but it wouldn’t be my own; so what’s the point?’); the young woman asks Prescott to amputate her forefinger at the second joint. She refuses to disclose her reasons for this bizarre request. Prescott declines, telling the woman that the science of surgery is for the relief of pain and anguish, ‘not for wilfull mutilation’. Angered, the young woman calls Prescott ‘pompous’ and slams her finger in the door, forcing Prescott to conduct the surgery. Prescott informs Van Dusen, asking the Thinking Machine to find out why the woman was so desperate to have her finger removed. When Van Dusen’s aloof manner aggravates Prescott, Van Dusen observes that ‘It’s a curious irony that those who call upon my services so frequently resent them’. Prescott tells Van Dusen that, ‘If you would only take people into your confidence…’; but Van Dusen interrupts and ends Prescott’s sentence for him, ‘… I should only delay myself and not enlighten them’. Working with Roderick Varley (Mark Eden), an associate who works as a reporter, Van Dusen attempts to solve the mystery of the woman with the titular superfluous finger and uncover the relationship between the woman and the events depicted in the precredits sequence. Focusing on Dagobert Trostler (played by Ronald Lewis), ‘Anonymous Letters’ takes place in Vienna. The character of Trostler was created by Adalbert Goldschieder (writing under the pseudonym of Balduin Groller), who openly attempted ‘to create a Viennese version of that master detective [Sherlock Holmes]’ (Tannert & Kratz, 1999: 227). Conceived as a wealthy bachelor who acts as ‘a sought-after confidant of those noble and wealthy Viennese whose romantic indiscretions or financial peccadilloes threaten scandal or ruin’, Trostler appeared in eighteen stories between 1890 and 1914 (ibid.). In ‘Anonymous Letters’, Trostler is approached by the Countess Nadja (Nicola Paggett), a former leading light of the theatre. Nadja has been receiving anonymous letters that threaten to reveal to Nadja’s husband, Archduke Othmar (Michael Aldridge), allegations that Nadja has been conducting an affair with another man. Nadja’s friend, the widow Tildi Leys (Carolyn Jones), has also been receiving similar letters. Through careful analysis of the expensive paper and ink used to create the letters, and by examining closely the handwriting ('There are certain terms of phrase, […] a flamboyancy even, which suggest we are dealing with a man'), Trostler creates a list of eight suspects. Trostler also finds on the letters traces of a specific brand of Turkish tobacco, Sultan Flor, which appears to enable Trostler to further reduce his list of suspects; and Trostler finds the majority of his attention directed towards Walter Frankenburg (Francis de Wolff). Meanwhile, Trostler begins to fall in love with Tildi, and it appears that Tildi begins to fall in love with Trostler. However, Trostler establishes Frankenburg’s innocence and the tone of the letters becomes increasingly menacing: in Trostler’s words, it is ‘as if the cat had tired of playing with the mice and was going in for the kill'. ‘Anonymous Letters’ is an interesting take on the conventions established in Conan Doyle’s Sherlock Holmes stories, but Trostler is – compared with Van Dusen or Valmont, for example – a relatively bland and uninspiring protagonist. This episode makes provocative use of the femme fatale archetype but, in sum, is a fairly straightforward and conservative mystery: ‘Anonymous Letters’ proves, as Van Dover asserts in You Know My Method, ‘absent the touch of extravagance present in Poe, Futrelle, and even Conan Doyle, severe methodology could become tiresome’ (op cit. : 129). Adapted from R. Austin Freeman's story, 'The Moabite Cipher' sees the return of Dr John Evelyn Thorndyke, the protagonists of the very first episode of The Rivals of Sherlock Holmes. Thorndyke is played by Barry Ingham, and his assistant Jervis is played by Peter Sallis. R. Austin Freeman was a licenced physician, and his creation Dr John Evelyn Thorndyke was one of the earliest medical sleuths. Thorndyke was, in Freeman’s words, ‘a medico-legal expert and his methods are of medico-science’ (quoted in Sampson, 1984: 11). The Thorndyke stories are therefore the earliest examples of the forensic crime narratives that are so popular today, from Quincy, M.E. (NBC, 1976-83) to Silent Witness (BBC, 1996- ) and CSI (CBS, 2000- ). Adapted from a story first published in 1909, 'The Moabite Cipher' opens during the visit of the Russian Grand Duke to London. 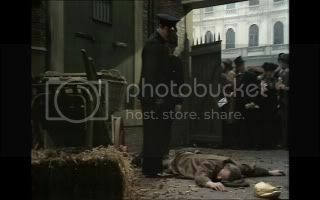 The police have been commanded to watch out for anarchists, and one particular man (played by Clive Rodgers) – who is suspected of being an anarchist – is chased by police into an alleyway, where the man promptly dies, a wrapped package next to the body. The police believe the package to contain a bomb, but Thorndyke reveals that its contents are nothing more sinister than a pork pie. 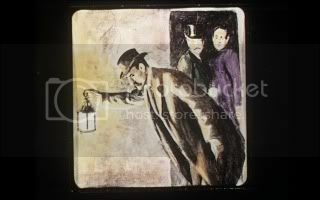 The dead man is also revealed to be carrying a letter addressed to Adolph Schonberg (George Innes). The police believe that the dead man may be Schonberg, but Thorndyke concludes that 'If it [the letter] is his, why was he carrying it?' Thorndyke suggests that the dead man was delivering the letter to Schonberg. The contents of the letter are written in code, a form of Hebrew known as Moabite. 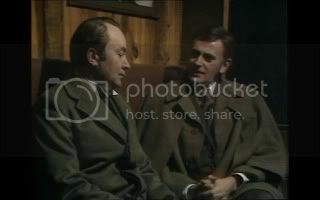 Thorndyke is visited by Superintendent Miller of Scotland Yard (Nicholas Selby). Miller is 'in charge of a special section dealing with political matters' and claims that 'in view of the present situation, plus the visit of the Grand Duke, we are taking the letter very seriously': according to Miller, 'This country's whole relationship with Russia could be in jeopardy'. The police have asked a linguistics expert, Professor Popplebaum (Derek Smith), to translate the letter. However, the words in the letter are scrambled and appear to make little sense. 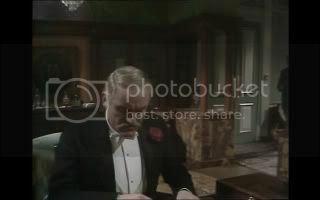 Thorndyke ponders the problem, but before he can reach a conclusion he is visited by a stranger, Alfred Barton(Julian Glover). Barton claims that his brother, who lives in the countryside, has been struck by a stomach infection. Barton suggests that his brother is being poisoned by his younger wife; he provides Thorndyke with a sample of the food fed to Barton's brother by his wife, and after analysing the food Thorndyke concludes that the young woman has been feeding arsenic to her husband. 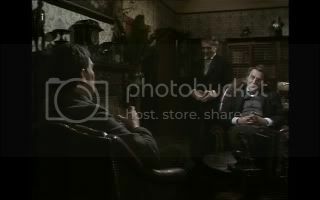 Barton insists that Thorndyke and Jervis accompany him on a trip to his brother's house, to convince his brother that his life is in danger. 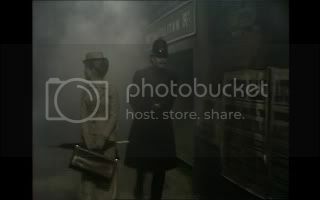 However, on the train Thorndyke and Jervis are abandoned by Barton; Thorndyke suspects Barton of attempting to divert him from the case involving the mysterious letter, and returns to London immediately. 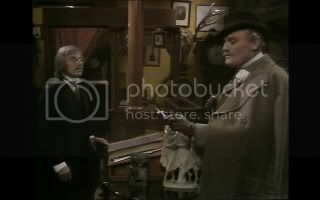 There, Thorndyke and Jervis discover Barton in the process of ransacking Thorndyke's home; he is attempting to recover the letter. After Barton is captured, Thorndyke attempts to solve the riddle of the letter. The solution appears to be more complex than the one offered by Professor Popplebaum. 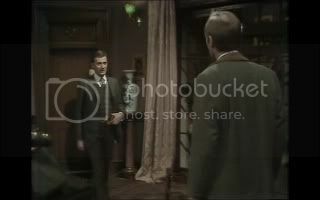 This episode seems more closely modeled on the Sherlock Holmes narratives than the work R. Austin Freeman, with Jervis and Thorndyke's verbal sparring being reminiscent of the relationship between Holmes and Watson: at one point, in a Holmesian monologue Thorndyke tells Jervis, 'You worry me sometimes, Jervis – the way you give way to mental indolence. You have had all the facts I have just described. Now you must examine these facts separately, and then collectively, and in relation to the circumstances'. 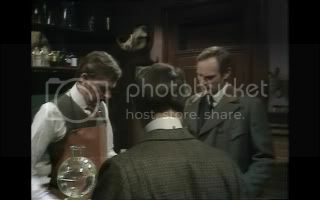 Finally, at the end of the episode Thorndyke tells Jervis that 'It was almost elementary'. 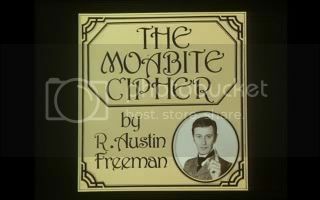 As a pastiche of the classic Sherlock Holmes-style tale, 'The Moabite Cipher' functions very well, aside from the hurried conclusion, where flat and uninspiring camera setups negate the drama and dispel any suspense. 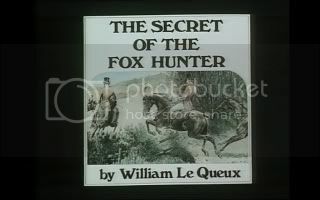 Along with E. Phillips Oppenheim, William Tufnell Le Queux was one of the earliest practitioners of the modern espionage novel, creating the character of the 'rogue male' lone-wolf secret agent that would go on to be central to the work of authors such as Geoffrey Household, John Buchan, Eric Ambler and Ian Fleming. 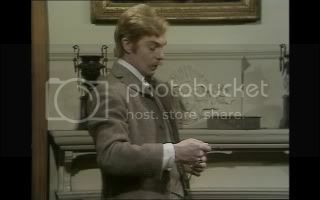 This story features Derek Jacobi as Le Queux's creation William Drew. 'The Secret of the Fox Hunter' opens at a waxwork display of Prince Albert, where Drew makes contact with Maude Baines (Denise Coffey). Baines has been working as a governess in the household of Count Krempelstein (Richard Warner), a Prussion Colonel in the Hussars. Baines tells Drew that 'Krempelstein, chief of German intelligence, has arrived in England'; as she passes her report to Drew, she comments that it is 'Most disturbing'. Drew discusses the matter with the Foreign Secretary (Ralph Truman). The Foreign Secretary tells Drew, ‘Dash it all, Drew: it’s hard to believe an officer like this would stoop to spying’. In response, Drew confidently asserts, ‘Yes, if it were an Englishman, my lord, it would be unthinkable: regrettably, these foreigners don’t share our scruples’. It seems that Krempelstein has arranged to be part of the foxhunt with the famous Fitzwilliam pack. He has cancelled a military confidence to join the hunt. As Drew is friendly with the leader of the hunt, George Fitzwilliam (Peter Eyre) and his wife Sybil (Karin MacCarthy), Drew volunteers to stay with the Fitzwilliams in the hope of finding out more about Krempelstein's plans. 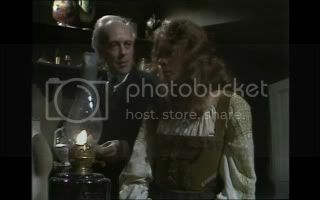 At the Fitzwilliams' home, Drew is introduced to Beatrice Graham (Lisa Harrow), who is engaged to Jack Bellingham (Simon Gough), a member of the British embassy in Petersburg. When Graham is discovered dead in the grounds of the Fitzwilliam house, apparently injected with some kind of poison, Drew uncovers a plot to sell a copy of the new Russo-German treaty to a French agent named Laval (Henry Szeps). Drew, Baines and Bellingham travel to Paris in order to prevent Krempelstein from handing the documents over to Laval, and Drew is forced into an encounter with the very same poison that killed Graham. This episode benefits from a strong performance by Jacobi as William Drew. Some of the Anglo-centric views within Le Queux's work seem to be foregrounded (as in the aforementioned scene in which view tells the Home Secretary that 'regrettably, these foreigners don't share our scruples'), and at times the episode almost approaches a parody of the original text. Nevertheless, there is considerable suspense, and the conclusion – despite the flat camera set-up that also marred the conclusion of 'The Moabite Cipher' – is genuinely powerful. 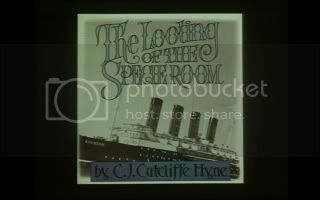 'The Looting of the Specie Room' is adapted from a story first published in Pearson's Magazine in 1900. The story features an appearance of C. Cutcliffe Hyne's character 'Mr Horrocks, Purser', played in this adaptation by Ronald Fraser. The story begins in New York, 1910. A mysterious man books a cabin on a steam liner sailing from New York to Southampton, via Liverpool. The man insists on taking cabin number A15. 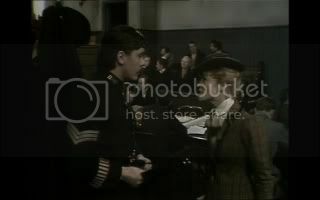 Mr Horrocks, the ship's purser, is called to see Lord Altington (Paul Hardwick), the owner of the ship. Altington reminds Horrocks that 'we are breaking two records with this voyage. One, we are carrying the largest consignment of bullion ever to cross the Atlantic, a quarter of a million in gold; and two, we're making the fastest ever trans-Atlantic crossing'. Alting also tells Horrocks that two journalists, Fox (John Tordoff) and Gaylord (John Bancroft), are also on board: Altington refers to them as 'the ill-named “gentlemen of the press”'. 'Get them drunk and keep them drunk from here to Southampton docks', Altington tells Horrocks, so that the journalists may not 'do the dirty on us' if the ship fails to break the record for the fastest trans-Atlantic crossing. Altington concludes his meeting with Horrocks by asserting that 'the safety of the bullion is your entire responsibility'. The bullion is securely locked in the ship's specie room. However, after the ship docks in Liverpool Horrocks inspects the specie room and discovers that half of the bullion (worth 125.000 pounds) has been stolen and replaced with sand. As the only apparent entrance to the specie room is through the door, and Horrocks has the only set of keys, Altington reminds Horrocks that he is entirely responsible for the fate of the gold, and Horrocks must discover what happened to the bullion, how it was transferred out of the specie room, and what the crime has to do with the widow Mrs Vanrenen (Jean Marsh), the ship's First Officer Clayton (Stephen Yardley) – who is an inveterate gambler who has threatened to kill Horrocks, 'take [his] keys and rob the specie room' – and the respected peer Sir Edward Markham (Edward Dentith). 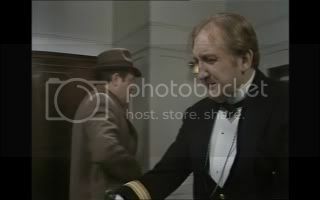 This episode features a great performance from Ronald Fraser as the astute Horrocks, a man who is underestimated by his superiors. 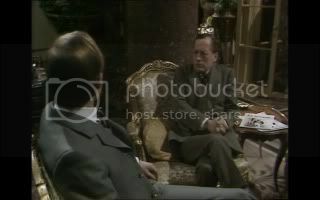 Horrocks' uncle has recently died, and Clayton tries to pressure Horrocks into lending him several hundred pounds to cover his gambling debts. However, Horrocks has used his uncle's inheritance to set up an orphanage and spends 'every penny of my wage' to keep it running. According to Horrocks, Altington 'would be furious if he knew I had another interest outside his wretched company. As far as the outside world is concerned, I'm just a man who squandered two thousand pounds in twelve months on some mysterious vice, and therefore have every motive for the robbery'. Through the episode, Horrocks also shows polite disdain for the powerful: at one point, Mrs Vanrenen comments that the ship is carrying a respected peer (Sir Edward Markham), and Horrocks matter-of-factly tells her, 'You'll often find that men who've received knighthoods for exceptional services to their country are also exceptional in other directions: exceptionally loud, exceptionally rude, and exceptionally mean'. Fergus Hume was the author of the 1898 anthology Hagar of the Pawn-Shop. Hume's Hagar stories revolved around the character of Hagar, a young gypsy woman, who in each story handles, via her uncle’s pawn shop, goods that have some relationship with a crime. In each story, Hagar is positioned as an unwitting amateur sleuth, her conscience driving her to uncover the mysteries surrounding the objects that pass through the pawn shop in which she works. 'The Mystery of the Amber Beads' features Hagar (Sara Kestelman) involved in the mystery surrounding the murder of an elderly woman, Mrs Arryford (Doris Rodgers). In the pre-credits sequence, Arryford is strangled to death by someone who uses the woman's own diamond-studded amber necklace to throttle her. After the credits, Hagar is introduced in her uncle's pawn shop (on Waterloo Road). It appears that Hagar's uncle has recently died ('There was no love lost between him and me', Hagar declares); and in the absence of a will, a man named Horace Vark (Philip Locke), who claims to be Hagar's uncle's friend, is claiming ownership of the pawn shop and the rest of Hagar's uncle's estate. Whilst Hagar and Vark are arguing over ownership of the pawn shop, a mysterious woman enters and attempts to pawn what appears to be the same amber necklace that was used to murder Mrs Arryford. The woman refuses to speak to Hagar and Vark; and when asked if she is dumb, she nods. After the woman has left, Vark threatens Hagar, telling her 'One week, and I want my property; one week, and out you go'. Vark leaves, and Hagar is visited by Detective Sergeant Grubber (Joss Ackland). At first, Hagar suspects Grubber of prejudice towards her, but gradually she warms to the gruff policeman. He is looking for the stolen necklace and tells Hagar of the murder of Mrs Arryford. When Grubber tells Hagar that Arryford's waitress, Rose (Sarah Craze), and Hagar reveals that the woman who pawned the necklace in her uncle's shop claimed to be dumb also, suspicion immediately falls on Rose. However, Hagar makes contact with Rose, who is now a fugitive, and begins to suspect Mrs Arryford's friend and employee, Miss Lyle (Kathleen Byron), and her nephew Freddy Jeddings (Stephan Chase). 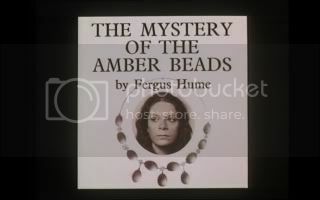 An interesting episode, 'The Mystery of the Amber Beads' features a very different protagonist from the bulk of the other episodes within this series: not only is Hagar working class, but she is also a woman and an unwitting amateur sleuth. The solution to the mystery presented in the narrative is predicated on the concealment of a family secret, and ultimately the episode confronts in various ways the issue of prejudice. At least three characters in the narrative have secrets that they are desperate to conceal from their associates. An enjoyable experience, this particular episode is all the more engaging for the ways in which it deviates from the more rigid formula of the other episodes in this series. 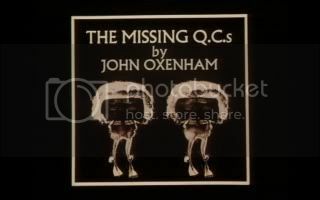 Adapted from a story by John Oxenham, 'The Missing Q.C.s' focuses on Charles Dallas (Robin Ellis). Dallas is a junior defence counsel in the case of George Thomas Wilson, a man who has been arrested for the murder of his wife Agatha. Dallas is engaged to Milly Revill (Celia Bannerman) and is employed by Milly’s father, Sir Revel Revill (John Barron). During the trial of Wilson, Professor Augustus Dyne (John Phillips) is called as a witness. Dyne is presented the Bible but refuses to swear in, stating that he’ll ‘have none of that religious hocus pocus’. Dyne, an expert on mental illness, asserts that Wilson is not insane and is therefore fit to stand trial for Agatha’s murder. However, as the trial progresses it is discovered that one of the lawyers, prosecuting counsel James Ladbroke (Jack May) has disappeared. Soon after, Sir Revill also mysteriously vanishes. Dallas is implicated in Sir Revill’s disappearance when it is revealed that Sir Revill received a note that claimed to be from Dallas; it is this note that pulled Revill away from the courtroom. However, the letter was written by an imposter, someone who mimicked Dallas’ handwriting. Shortly after this, Milly disappears too; Dallas takes it upon himself to investigate the mysterious disappearances of Ladbroke, Sir Revill and Milly. The episodes are presented in their original broadcast screen ratio of 4:3. Shot on videotape, the episodes are handsomely presented here. The image is detailed, and the source material shows almost no signs of wear and tear. The original break bumpers are intact, and the episodes appear not to suffer from any edits. The discs contain a two-channel mono track, which is audible and problem-free. There are no subtitles. 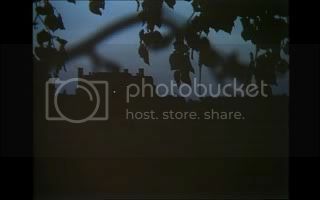 Sadly, there is no contextual material, aside from an image gallery (4:46) on disc one. The first series of The Rivals of Sherlock Holmes is arguably more consistent in terms of quality, whilst also curiously exhibiting a broader range of story types (including an episode focusing on William Hope Hodgson’s ‘ghost detective’ Carnacki, played by Donald Pleasance). 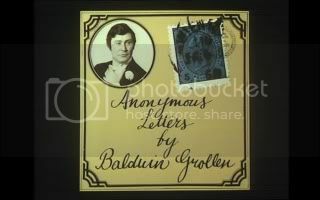 There are a greater number of ‘ho-hum’ episodes in this second series (for example, ‘Anonymous Letters’). However, the episodes contained in this set nevertheless contain some interesting themes and some great performances. Viewers new to the series should start with series one, but those who have watched and enjoyed the first series should be confident that this second (and final) series of The Rivals of Sherlock Holmes is a worthwhile purchase. However, it’s curious that the series ended with such a left-field episode as ‘The Missing Q.C.s’. For more information, please visit the homepage of Network DVD.